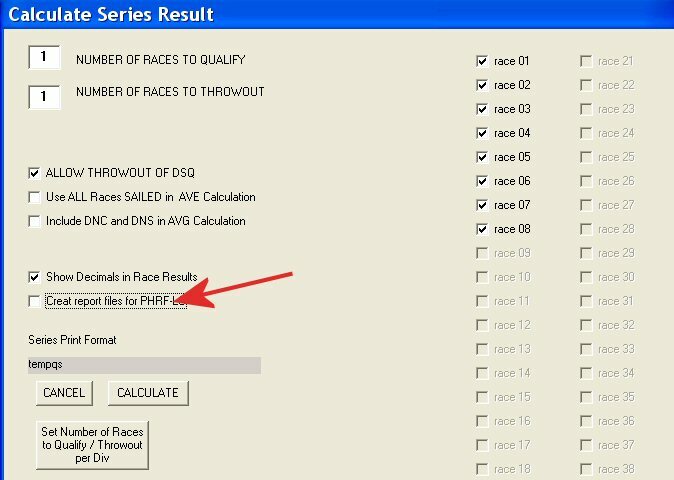 Dan Hollands (author of Quickscore) has built in an automated function that creates the files (in the exact format) that is needed for importing into the PHRF-DMS race analysis program. 1. Click "Series Total", "Calculate Series Results" and click on the Calculate button. Make sure to "check" the "Create report files for PHRF-LO" checkbox. 2. The files are automatically created and have been stored in the same location as your Registration data. 3. To find where your files are located, click on "File", "Open Existing Reg File" and you will be able to "Look in" the location where the csv files have been stored. Record the location. 4. Browse to the location you recorded in step 3 and you will find several files named the same name as the series you calculated in step 1 with the addition of Div 1, Div 2, Div 3 etc (one file for each division in that series), with a csv file extention. 5. Send those csv files to the PHRF-LO administration office.